I just pulled the trigger on an eBay listing for the bronze KEYone and just noticed it was the BBB100-5 variant. Can anyone confirm if this is the China version that does not support Google? If so, I'm going to have to cancel the order... quickly! Which bronze BBB100-* variant does CBK have? PS: @thurask, I remember you having a KEYone variant thread that lists all the BBB100-* models but for the life of me can't find it. That thread should be sticky'ed! Can you please paste the URL? The -4 and -5 are Chinese. The EMEA -2 or -7 are the correct ones to get. The -7 is dual SIM (and I believe the only one available as of now). Last edited by conite; 04-15-18 at 01:05 PM. Thanks! Better cancel my order!!! 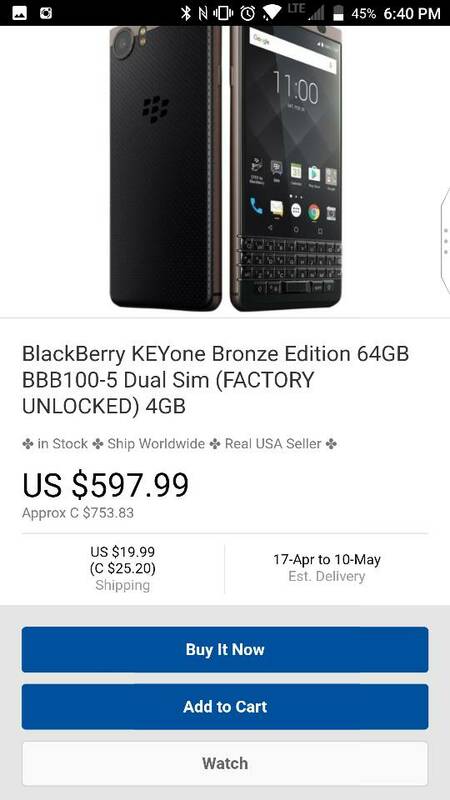 Just to confirm, the bronze KEYone that CBK is the BBB100-2? ANd that's a dual sim device (which is what I need)? Thx! They are all dual-SIM AFAIK. Actually the EMEA dual SIM is likely the BBB100-7 like its black counterpart. Not exactly; unlike the -4, there are different OEM versions of the -5. The -4 only exists with a China OEM file (i.e. no Google), while the -5 exists in common, China, and Russia (somehow) forms. Depending on where the -5 is being shipped from it's either a China (from China) or common (from the Middle East) OEM file. There might be bronze versions of the BBB100-1/2, but those would still be single SIM. 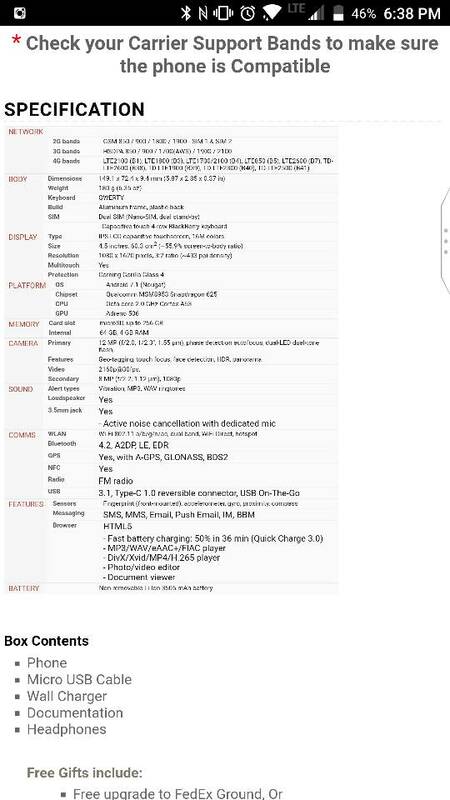 The BBB100-5, surprisingly for a phone sold in China, has all of the bands of the BBB100-1/7 plus CDMA 0. But the -7 does exist though. I'd be worried about getting a -5 as to which Chinese version it might turn out to be. Would you agree? I guess, although asking the seller should probably clear that up. I suppose. Provided of course they speak English and know what the heck they're talking about. Lol. So, to clarify after thurask's info, get the -7 if you want to be sure, or the -5 if you can be confident you are getting the correct variant. Thanks for all the input. I did reach out to the seller and they replied "not the china model". They're also located in Houston, TX so I think there's a good chance this is the EMEA variant of the -5 and not the China one. What do you think? It's been 5 months since I got the India dual SIM KEYone and I'm itching for something new to tide me over until the Athena becomes reality! Yep. This is a problem with ebay and buying devices from Hong Kong/mainland China. If it wasn't for my Chinese speaking wife I would be holding a brick right now. There are so many versions/models and confusing tech details that many people end up with a substandard or non-working device. I was almost one of those people just as the OP was. Hopefully he successfully cancelled his order. If he's from the US, that would give me a bit more confidence assuming he's sold others. As long as he will take it back, I say "why not?"! Last edited by danfrancisco; 04-15-18 at 02:32 PM. I've decided to roll the dice and go through with the purchase. Based on thurask's info - what would the CB community be without him or you conite??? shudder - I feel good that I'm getting the -5 EMEA variant. And if not, the seller does have a 30 day return policy, which means that this would have been a $50 failed experiment for me (shipping here and back). So do we have the official word on how many different bronze KEYone variants there are? They said it would be dual SIM in "certain markets", i.e. the same deal with the black KEYone not being the same everywhere. That said, between their website and the OS dumps I've been collecting, there are regulatory PDFs for the BBB100-5 in Chinese (Mainland and Hong Kong), Arabic, and several European languages (UK English, German, Greek, Spanish, Italian, Romanian, Portuguese). Because TCL shows the same care to keeping their paperwork in order as they do quality control, there are other BBB100-5 PDFs in the OS for US English, but those are actually describing the BBB100-3. As for other markets, there are mystery PRDs for BBB100-1 that popped up recently with no prior history (PRD-63116-026, PRD-63116-050); while there's no confirmation that they're the bronze KEYone for other markets, there's no confirmation that they're not, either. On that note, once the BBB100-5 arrives, could you please post the PRD that's on the box label? For sure. I absolutely will. I’m very curious to see what I’m going to end up getting. Hey @Carjackd, you’re all over social media... see if you can find out what variant bronze KEYone CBK is rocking! I decided to cancel the order since there was too much uncertainty as to which device I would end up getting (eBay seller gave me a full refund since he hadn't shipped it yet). I have an engineering contact at BBMo who's looking into the various bronze KEYone variances. Once I have more concrete info, I'll go back to the seller and ask him to clarify exactly what he's selling.